The heart of winter, with its short days and cold temperatures, beckons us to the family home. All of this inside together time can have parents scrambling for fresh activities to make the most of the season. No need to get fancy. Make some snacks and break out that deck of cards you know you have somewhere. Impress the kids with your shuffling skills and enjoy a riveting tournament of Go Fish, 500 Rummy, or even Poker. Choose a movie to enjoy together then prep snacks, decor, costumes or crafts in the theme of the movie. For example, a “Star Wars” night may call for some blue milk and cinnamon buns, Star Wars pjs or costumes, a build your own droid craft, and space-themed decor. As a family, work together to decide on and prepare dinner. Involve the kids at every stage from prepping ingredients, to setting the table, to cleaning up. Don’t underestimate what they are capable of. Enjoy the fruits of your labor as you sit down to your delicious meal. While the weather may not be conducive to a traditional camping, there’s nothing stopping you from making hamburgers and hotdogs and camping out in the living room. 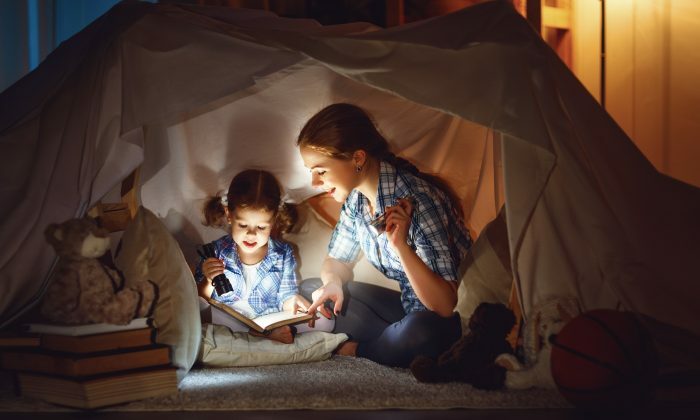 Follow up with s’mores and bedtime stories read by flashlight, or enjoy a nature documentary from your sleeping bags. Head to that stack of board games and choose one that’s suitable for all the ages of your kids. Some of my family’s current favorites are classics like Pictionary, Scrabble, Monopoly, and Trivial Pursuit: Disney. When the weather outside is frightful, there’s no need for family time inside to be anything less than delightful. Enjoy your next family night in!